We are very excited to announced new additions to OrCAD® product line to accelerate the mainstream PCB design process and provide a significant boost to productivity and efficiency. The new OrCAD products include OrCAD Engineering Data Management (EDM), a comprehensive collaboration and management environment for OrCAD Capture; OrCAD Documentation Editor, an intelligent, automated PCB documentation environment; and OrCAD Library Builder, a rapid automated part builder. OrCAD EDM enables efficient schematic design collaboration and management among engineering teams within their OrCAD Capture environment. It combines an easy-to-use, intuitive interface with design and data management capabilities to ensure that data integrity and project status is managed throughout the schematic design process. EDM enables engineers to work efficiently together as a group, regardless of geographic location, resulting in better team productivity, efficiency and faster time to market. OrCAD Documentation Editor provides an intelligent, interactive PCB documentation environment that enhances and simplifies the PCB documentation process utilizing automation and advanced technologies, easing the entire process from creation through distribution and usability. It shortens PCB design time by reducing documentation time up to 60 to 80 percent. 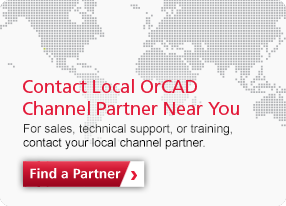 For more information about these new OrCAD technologies, please visit product links on the right side of the page. The technology available within the new OrCAD Library Builder product has enabled us to significantly reduce the amount of time spent creating and maintaining our symbol and footprint libraries. Even a mistake as small as a single missed pin can result in a significant cost and schedule impact. With the OrCAD Library Builder technology and its advanced library verification tools, we do not have to worry about these kinds of errors anymore.